Called the "Tripartite Life of St Patrick", this manuscript tells the saint's life in the form of three homilies, each of which starts with a brief introduction. A scribe named Domnall Albanach O'Troighthigh, "of the house of O'Troighthigh in Baile of Moinin," wrote on the first page that he finished it on 29 July 1477. The O'Troighthigh are thought to have been based in County Clare, near Corcomroe. 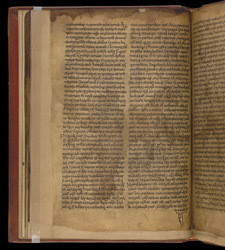 Domnall Albanach may have been copying another manuscript which in turn was a copy, now lost, made by a scribe at Cashel of the original compilation, which could date from as early as the 9th century or as late as the 11th, from sources that were earlier still. Comparisons between different copies spanning centuries attest to the fidelity of the scribes to the words of the book they copied. The third 'homily' starts on this page, although its beginning is barely indicated by a very slightly enlarged first letter, near the top in the first column. Our hero is in Connaught, bidding farewell to the priest Conaed at Domnach Airthir Maige. He moves on to found churches and monasteries in County Meath and Tyrone.